Immerse yourself in an inspiring weekend, creating sisterhood, manifesting abundance, appreciating nature & celebrating creativity! The best way to attract creativity, prosperity and abundance into your life is to begin with experiencing these gifts. Join 2 inspiring women at a hilltop retreat in a private Vermont community for a weekend of wellness through art, essential oils and bountiful natural beauty. Just 2 1/2 hours from Boston and 4 hours from NYC, this creative experience will be limited to 10 adults in order to provide connectivity and focused intention. When we start creating, we feel more creative, when we envision abundance we can manifest it, when we invite & learn how to incorporate oils into your routine, we are inviting a healthier lifestyle, when we enter an inspiring atmosphere we feel more inspired! Sprinkling essential oils with simple guided meditation, 2 Essential Oil workshops, a vision board workshop, an optional guided lakeside hike, 2 creative art workshops, unlimited use of our indoor spa, indoor sauna, & private outdoor meditation room, a private aromatherapy treatment, 2 dinners and 2 breakfasts. Time will be provided on Saturday to explore our charming village. Learn traditional weaving or design a contemporary version of a beautiful dreamcatcher. Delve into a collection of antique lace, satin ribbons, beautiful beads and exotic feathers for your one-of-a-kind creation, or bring your own materials, trinkets and crystals to add a meaningful touch! Join Elizabeth Karsch on a journey of expressive markmaking as she guides you through the practice of using line and color to release emotions, answer questions and tap into the energy around you. All materials will be provided. Elizabeth Karsch is a visual artist and mother of two busy girls. Her abstract paintings and mixed-media work present narratives on the flow of energy around people and things. Elizabeth’s artmaking process is contemplative and therapeutic; each ink mark or stroke of paint represents a feeling or a reflection of her experiences, conversations, and dreams. She also paints to communicate to her parents, who have both passed away, and feels most connected to them and to the world around her when the brush takes over. Elizabeth brings this artmaking process to her classes and art retreats: her painting and drawing process encourages emotional release, thoughtful contemplation and a deeper understanding of oneself through the use of color and line. Karsch studied Studio Art and Art History at Skidmore College in Saratoga Springs, NY and at SACI in Florence, Italy. For 8 years, she managed pottery painting studios on Long Island’s east end, teaching painting and drawing to adults and children, operating art camps and curating exhibits for local and emerging artists. Creative retreats are a new and exciting endeavor for Elizabeth, and she looks forward to sharing her process and encouraging creativity with new friends and guests! Kristin Davey is a certified yoga instructor, essential oil wellness advocate, and mother to 3 dynamic children. She has owned and operated Peaceful Planet Yoga on Long Island's east end since 2009, where she holds yoga classes, essential oil workshops and community events. Kristin has a Masters Degree in Elementary Education and holds 3 yoga teacher certifications. Kristin is honored to have attended a variety of classes & workshops with world renowned teachers including Elena Brower, Sean Corne, Rod Stryker, Gabrielle Bernstein, MC Yogi, Colleen Saidman Yee and Rodney Yee. An enthusiastic world traveller and lifelong student, Kristin has been inspired by her journeys, has learned from her students, and has been blessed by the imprint yogi masters have left on her life. Kristin frequently travels to yoga studios, salt caves, wellness centers & yoga festivals drawing inspiration to share with her students. 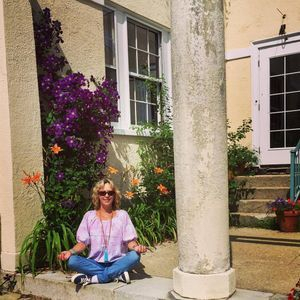 Kristin offers Essential Oil Workshops, Education & Retreats for women at her mountain home in Southern Vermont and looks forward to the opportunity to take her retreats on the road and across the globe!